(C) 2013 Meike J. Wittmann. This is an open access article distributed under the terms of the Creative Commons Attribution License 3.0 (CC-BY), which permits unrestricted use, distribution, and reproduction in any medium, provided the original author and source are credited. The cladoceran Daphnia lumholtzi is a subtropical and tropical zooplankter, and an invasive species in North America. Thus far, Daphnia lumholtzi has not been detected in Europe. Here we investigated whether a hypothetical introduction to Europe could result in a successful invasion, either now or in the near future when facilitated by climate change. In laboratory experiments, we tested whether different clones of Daphnia lumholtzi can invade a resident community consisting of native Daphnia from lake Klostersee, Germany, and how invasion success depends on temperature and the presence or absence of planktivorous fish. In some treatments, invasion success was consistently high, and Daphnia lumholtzi reached densities similar to the native competitors by the end of the experiment. The presence of a planktivorous fish reduced the invasion success of Daphnia lumholtzi, and a clone with an inducible defense against fish predation was a more successful invader than a permanently defended clone. Of the three temperatures tested in this study (15, 20, and 24 °C), invasion success was highest at 20 °C. To understand the competitive interaction between native and introduced Daphnia, we fit a Lotka-Volterra-type competition model to the population dynamics. Our experimental and modeling results suggest that Daphnia lumholtzi can invade European lakes and can cause substantial declines in the population size of native Daphnia, with potential consequences for higher trophic levels. In their attempt to understand the determinants of invasion success, most studies focus on invasions that have already occurred. For example, many studies try to identify characteristic traits of invasive species, using data from previously successful invaders (Jeschke and Strayer 2006, van Kleunen et al. 2010). Another popular approach is to use ecological niche models, also known as species distribution models or bioclimatic models (Peterson and Vieglais 2001, Peterson 2003, Jeschke and Strayer 2008). In the latter method, presence/absence data from a species’ native range, together with information on climatic and other abiotic variables, are used to build a statistical model of the species’ niche. This can then be projected onto geographical regions where the species could potentially invade (Peterson and Vieglais 2001, Peterson 2003). An approach that has been less frequently applied in invasion biology is to combine experimental and modeling techniques in order to mechanistically understand biological invasions and use this understanding to predict future invasions. We follow such a mechanistic approach here, using the example of a possible invasion by the cladoceran Daphnia lumholtzi Sars in Europe. This zooplankter is native to subtropical and tropical regions of Africa, Australia and Asia, where it is found up to the Middle East (Benzie 2005). Daphnia lumholtzi has likely been transported from Africa to North America together with fish imported to stock reservoirs (Havel and Hebert 1993). Since it was first observed in North America in 1991 (Sorensen and Sterner 1992, Havel and Hebert 1993), Daphnia lumholtzi has colonized a wide variety of water bodies throughout the south-central United States and recently also the Great Lakes and the West Coast (Havel and Shurin 2004). There are many similarities in climate patterns between Europe and North America, and in the course of climate change, the European climate is expected to become more suitable for subtropical or tropical species. Hence, an important question is: Can Daphnia lumholtzi also invade European lakes, now or in the near future? A number of studies have investigated how the invasion success of Daphnia lumholtzi in North America depends on temperature, intensity of fish predation and competition with native North American zooplankton species. Since Daphnia lumholtzi experiences high temperatures across its native range, it is not surprising that it is well adapted to the high summer temperatures of water bodies in the south-central US. Indeed, when temperatures rise above 25 °C in late summer and the populations of native Daphnia species decline, Daphnia lumholtzi reaches its highest density (Lennon et al. 2001, Havel and Graham 2006). Life-table experiments indicate that Daphnia lumholtzi has a positive intrinsic growth rate between 11 and 38 °C, with a temperature optimum at 24 °C (Lennon et al. 2001). Unique characteristics of Daphnia lumholtzi are the long head and tail spines that most clones form in response to chemical cues released by fish (Dzialowski et al. 2003). In this article, we will call such a clone inducibly defended, independently of whether it currently exhibits a defense or not. Some other clones are permanently defended: they carry these defenses even in the absence of predator cues. Swaffar and O’Brien (1996) and Kolar and Wahl (1998) conducted feeding experiments with bluegill sunfish (Lepomis macrochirus) on Daphnia lumholtzi compared to other Daphnia species. They showed that the spines of Daphnia lumholtzi make it difficult for juvenile sunfish to consume these defended Daphnia and strongly increase their handling time. Thus, predation pressure might be an important factor controlling the invasion success of Daphnia lumholtzi. In laboratory competition experiments under predation, inducibly defended clones were more successful than a permanently defended clone (Engel and Tollrian 2009). Temperature and predation do not only influence the growth rate of Daphnia lumholtzi, but also change the way this introduced species competes with native zooplankton species, such as native North American Daphnia. Fey and Cottingham (2011) and Engel and Tollrian (2012) observed, in laboratory experiments, that with increasing temperature there was a shift in competitive dominance from the native Daphnia pulex or Daphnia pulicaria to Daphnia lumholtzi. In a competition experiment, Daphnia pulicaria was the superior competitor without predation, and Daphnia lumholtzi the superior competitor with predation (Engel and Tollrian 2009). It is currently unclear which role competition plays for the invasion success of Daphnia lumholtzi in North American reservoirs. Although Daphnia lumholtzi tends to be abundant at times when native zooplankton are rare (Havel and Graham 2006), competitive effects can be weak, and it has been suggested that other factors than competition control seasonal patterns of Daphnia lumholtzi abundance (Johnson and Havel 2001). However, in a mesocosm experiment conducted by Dzialowski et al. (2007), Daphnia lumholtzi was only able to establish in resident communities with low densities of native zooplankton, suggesting that native communities can exhibit biotic resistance against Daphnia lumholtzi invasion attempts. In the popular statistical approaches used to predict future invasions (e.g. the ecological niche modeling approach introduced above), biotic interactions are usually neglected or assumed to be constant (Jeschke and Strayer 2008), which can be a problem if such interactions play a key role in determining under which conditions a species can persist (Davis et al. 1998). In the case of Daphnia lumholtzi, the studies mentioned above indicate that invasion success does not only depend on abiotic conditions such as temperature, but also on the presence of predators and possibly interspecific competition. Therefore, we used laboratory invasion experiments that take into account the interaction of Daphnia lumholtzi with the native European community and a more mechanistic competition modelto examine whether and under which conditions Daphnia lumholtzi would be able to invade a European lake, either now or in a warmer future. As an example scenario, we considered the potential invasion of Daphnia lumholtzi to the small prealpine Lake Klostersee in southern Germany (47°58'N, 12°29'E). In our experiments, we used three temperature levels: 15, 20, and 24 °C. In 1999, 15 and 20 °C represented typical spring or summer epilimnion temperatures in Lake Klostersee, respectively (Fig. 1). While a temperature of 24 °C was an extreme event in 1999, with a predicted surface warming by 4 °C until the end of the 21st century (IPCC 2007, scenario A1FI), it is expected to be a typical summer surface temperature in 2099, whereas 20 °C might then be a typical spring surface temperature. In addition to our investigation of the establishment success of Daphnia lumholtzi, we used our experimental and modeling results to consider the consequences of a potential Daphnia lumholtzi invasion for competing native species. Observed surface temperature in Lake Klostersee in 1999 (solid line) and predicted surface temperature in 2099 under climate change scenario A1FI (dotted line, see IPCC 2007).The temperature treatments used in our experiments are indicated by dashed lines. We collected native Daphnia in September 2009, using plankton nets in the middle of Lake Klostersee and performing several vertical hauls. Each clone used in our experiment consisted of the descendants of a single female from this original sample. Prior to the experiments, we kept the clones at 20 °C in semiartificial Daphnia medium based on ultrapure water, phosphate buffer and trace elements, and regularly fed them with Scenedesmus obliquus, a species of green algae which is commonly found in European lakes (see e.g. John and Tsarenko 2002, Haupt et al. 2009). We used three different native Daphnia clones in our study: clone 1 and 3 were identified as Daphnia hyalina and clone 2 as a Daphnia hyalina x cucullata hybrid. We used clones 1 and 2 in the first invasion experiment and clones 2 and 3 in the second. As introduced organisms, we used two Daphnia lumholtzi clones. The Arizona clone (AZ, from Canyon Lake, Arizona, provided by R. Tollrian and originally collected by J. Elser) is permanently defended against fish predation whereas the Texas clone (TE, from Fairfield Reservoir, Texas, provided by R. Tollrian and originally collected by K. H. Sorensen and R. W. Sterner) is inducibly defended. The bitterling (Rhodeus amarus), a planktivorous fish native to Middle Europe, served as an experimental predator. The fish we used were approximately 4.5 cm long. This length compares to 2–3.5 cm for bluegill sunfish used by Swaffar and O’Brien (1996), and 1–8 cm for bluegills used by Kolar and Wahl (1998). Kolar and Wahl (1998) found that bluegills with a length of up to 5 cm had difficulty in handling Daphnia lumholtzi and learned to reject them. In contrast, bluegills with a length above 5 cm were able to ingest Daphnia lumholtzi, although less efficiently than undefended Daphnia pulex. Swaffar and O’Brien (1996) also found that their smaller bluegills had difficulties in handling Daphnia lumholtzi. Since bitterlings differ in morphology and feeding mode from bluegills, we observed some of our experimental fish while they were exposed to adult permanently defended Daphnia lumholtzi. Their behavior ranged from ingestion to rejection. In other words, the defense of Daphnia lumholtzi appeared to provide partial protection against fish predation in our experiments. The first experiment took place from June to July 2010. The eight treatments differed in temperature (20 or 24 °C), introduced clone (TE or AZ), and predation regime (predation by a bitterling for 10 min per day or no predation) in a fully factorial design. Each treatment was replicated five times resulting in a total of 40 experimental units. The experiment was carried out in 30-L white polypropylene containers with semiartificial Daphnia medium which were placed in climate chambers with a 12 h:12 h light:dark cycle. We added 0.5 mg C/L of green algae (Scenedesmus obliquus) to each unit every second day. Algae were cultured in artificial Z medium (Zehnder and Gorham 1960) at 20 °C and a 20 h:4 h light:dark cycle. To create the resident native communities, we divided 60 L of a culture of each of the two native clones approximately equally into 40 portions, each with on the order of magnitude of 102 individuals. The portions were assigned randomly to the 40 experimental units and used to inoculate 15 L of Daphnia medium in each of them. One week after inoculation, we added 10 L of fresh medium to each unit, and one bitterling to each unit in the predation treatments. For most of the time, the fish were caged in a 5-L polypropylene container floating inside the experimental container. This served to avoid elimination of the entire population while guaranteeing a permanent release of predator-borne cues. The bottom and sides of this small container were removed and replaced by a 200-μm mesh, such that chemicals produced by the fish were exchanged through the mesh but Daphnia could not pass. The experimental units in the non-predation treatment had an empty 5-L container. Once a day, we released the fish for 10 min into the main compartment of the experimental unit and allowed them to feed on the Daphnia. After recapturing the fish, we provided them with dead defrosted red mosquito larvae (Chironomidae) as additional food. Two weeks after inoculation (time 0), we introduced 25 Daphnia lumholtzi individuals (AZ or TE, depending on the treatment) into each experimental unit. Twenty-five is a number of individuals that we expected to be large enough to make chance extinctions unlikely but that was still small compared to the size of the native population at time 0. These founding individuals had been randomly sampled from populations grown at 20 °C. To maximize the contrast between the two clones, the AZ clone had been exposed to fish kairomones during the week prior to introduction, whereas the TE clone was naive to fish at the time of introduction. We sampled 10% of the volume before the introduction at time 0, and we sampled 5% of the volume every seven days until the end of the experiment. We filtered the sampled volume through a 125-μm mesh and preserved the Daphnia retained by the mesh in 70% ethanol. At the time of sampling, we randomly redistributed the fish in the predation treatments on the experimental units within one temperature treatment. On day 1, four fish accidentally escaped from their containers (three units in the 24 °C, AZ treatment; one unit in the 24 °C, TE treatment), so that they were able to feed on the Daphnia of their experimental unit for an entire night. Since this lead to a strong decline in population densities, we decided to restock the respective units with approximately 500 native Daphnia (250 of each of the two clones) and six Daphnia lumholtzi. We determined this ratio by dividing the 25 introduced Daphnia lumholtzi individuals by the count of native Daphnia in the sample that we had taken 3 days before. In the predation treatments, fish metabolic end products accumulated over time and apparently inhibited Daphnia population growth. Thus, after 21 and 28 days, we replaced one third of the volume in each unit with fresh medium. To remove the old medium, we used an aquarium pump covered by a 125-μm mesh such that no Daphnia were lost from the units during medium exchange. To avoid extinction of the entire Daphnia community, from day 21 onward the fish were only put into their small containers for one hour per day and were not allowed to feed on the Daphnia anymore. The experiment ended on day 35. At this time, we sampled 1.25 L from the units in the non-predation treatment, whereas we examined the total volume in the predation treatment due to lower numbers of remaining individuals there. We counted the complete samples under a stereomicroscope at a magnification of 16. However, in predation units that contained more than 50 individuals in the previous week’s sample, we counted only 10% of the sample. Only individuals with clear contours of eye and body were counted, assuming that they were alive at the time of sampling. We distinguished native Daphnia and Daphnia lumholtzi according to the shape of their heads and tail spines. The second invasion experiment took place from March to April 2011. To better understand the observations made in the first experiment, we changed the experimental design in several points. We now chose the temperature treatments 15 °C and 20 °C in order to cover a wider range of temperatures. Because we suspected that the white container walls in the first experiment made it easy for the fish to spot Daphnia, we used black containers in the second experiment. We hypothesize that the light conditions in these black containers are more similar to those in natural lake environments. Because the chemical conditions in the containers had deteriorated over the course of the first experiment, we decided to regularly exchange medium in the second experiment. However, large-scale medium exchange is logistically challenging, and thus we had to reduce the experimental volume to 10 L.
We inoculated native communities in 5 L medium and filled up the containers to 10 L six days later. For the first 11 days, fish were allowed to feed for only 5 minutes per day, later 10 minutes per day. To avoid the accumulation of fish chemicals, the fish were not permanently present in the experimental units, but only while feeding. For the rest of the day, we kept them together in an aquarium in 10 L of medium at the same temperature. Every day, we filtered the medium from the aquarium and used it to replace 1 L of medium from each unit in the predation treatment. In this manner, we simulated the permanent presence of fish in these units. In the other experimental units, we replaced 1 L by fresh medium every day. Among the 25 introduced Daphnia lumholtzi, 5 were embryo-bearing females whereas the other 20 were randomly selected from the population. The second invasion experiment ended on day 42. Two treatment combinations (TE clone without predation at 15 °C and 20 °C), however, were continued as a long-term experiment until day 91. During this additional time, we exchanged 7 L of medium once per week. We used the following light-dark cycle: 11.5 h light: 0.5 h dusk: 11.5 h night: 0.5 h dawn. All other parameters such as food supply were identical to the first experimental setup. (see Zuur et al. 2009). For model selection, we used Akaike’s information criterion (AIC). Candidate models were all possible models including subsets of the single factors as well as two and three-way interactions. to the time series of population densities by minimizing the sum of the squared residuals with the L-BFGS-B method implemented in R’s optimization function. In this model, N is the native population size, L the population size of Daphnia lumholtzi, rN and rL are the respective intrinsic growth rates, KN and KL the carrying capacities, αNL and αLN the competition coefficients, and θ a parameter that determines the strength of density regulation. In both invasion experiments, the inducibly defended Texas clone established in all experimental units without predation (Tables 1 and 2). In the first invasion experiment, with one exception, all invasions in the predation treatment failed, whereas in the second experiment, the Texas clone established successfully under predation, and only the permanently defended Arizona clone failed consistently. In the absence of a predator, the Arizona clone had mixed establishment success. Temperature, predation, and the identity of the introduced clone, as well as the interactions between these factors, also strongly affected the population dynamics of introduced and native Daphnia (see Figs 2 and 3 for time-series plots). 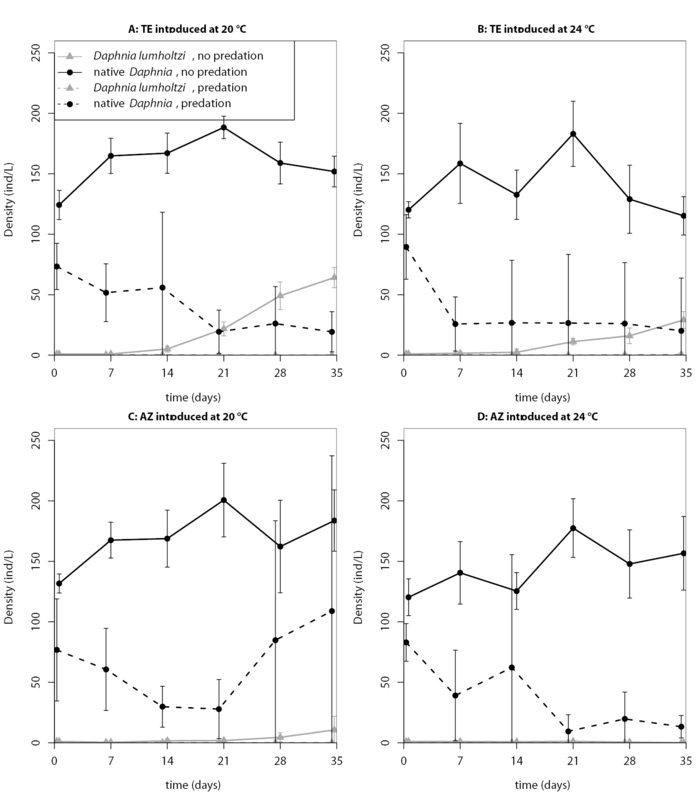 Consequently, the statistical models that best explained the proportion of Daphnia lumholtzi at the end of the experiments (lowest AIC score) included temperature, predation and clonal identity. The selected model for the second experiment also included all three two-way interactions but not the three-way interaction. On the other hand, for the first experiment, the interaction between predation and clonal identity was not part of the selected model (see Table 3 for estimated model coefficients and Table 4 for the AIC values of all candidate models). We used the estimated model coefficients to compute the final proportion of Daphnia lumholtzi that the models predict for the different treatment combinations (values in parentheses in Tables 1 and 2). Throughout, the Texas clone reached higher densities than the Arizona clone. Predation prevented, or at least slowed down, the population growth of Daphnia lumholtzi, especially that of the Arizona clone. In both experiments, the Texas clone at 20 °C had the highest invasion success. Fraction of replicates with Daphnia lumholtzi establishment for the different treatments in the first invasion experiment, and the corresponding final proportion of Daphnia lumholtzi, as predicted by the selected generalized linear mixed-effects model (in parentheses). Fraction of replicates with Daphnia lumholtzi establishment for the different treatments in the second invasion experiment, and the corresponding final proportion of Daphnia lumholtzi, as predicted by the best generalized linear mixed-effects model (in parentheses). Time series of the population densities (means ± standard deviations) in the first invasion experiment. Time series of the population densities (means ± standard deviations) in the second invasion experiment. Estimated model coefficients (ci in equation 2) for the best generalized linear mixed-effects model for the proportion of Daphnia lumholtzi in the community. Model selection for the proportion of Daphnia lumholtzi at the end of the experiment. The lowest AIC value for each experiment is highlighted in bold and indicates the respective selected model.T represents the effect of temperature, P predation, and C clonal identity; ai is a normally distributed random variable that is independently drawn for each experimental unit i. The long-term experiments provided additional insights into the influence of temperature on the invasion success of the Texas clone and its interaction with the native Daphnia. The simple Lotka-Volterra model (eqs. 4 and 5) together with the set of estimated parameters produces a satisfactory fit to the competitive dynamics (Fig. 4). At the cooler temperature of 15 °C, native Daphnia had the higher estimated growth rate. This was reversed at 20 °C. Competition was intensified with the increase in temperature and highly asymmetric at both temperatures, with Daphnia lumholtzi having much higher competitive effects on the native Daphnia than vice versa. The estimated carrying capacities for both species were higher at 20 °C than at 15 °C, and under both conditions, Daphnia lumholtzi had a smaller estimated carrying capacity than native Daphnia. The difference in the estimates for the parameter θ indicates that density dependence is stronger at 15 °C than at 20 °C. Furthermore, the Lotka-Volterra model allowed us to extrapolate the population dynamics and predict that at 20 °C, the native Daphnia would eventually reach a very low density or even go extinct, whereas at 15 °C coexistence with Daphnia lumholtzi would be possible. Time series of native and introduced Daphnia in the long-term experiments with the fitted and extrapolated Lotka Volterra model.<br/> A) 15 °C with estimated model parameters: <br/> rN=0.412, rL=0.204, αNL=1.88, αLN=0.000, KN=3.57 · 103, KL=1.16 · 103, θ=0.505 with a residual sum of squares RSS =1242993<br/> B) 20 °C with estimated model parameters:<br/> rN=0.143, rL=0.369, αNL=3.120, αLN=0.308, KN=4.53 · 103, KL=1.47 · 103, θ=15.3 and RSS = 940080. In our experimentally simulated introductions to European lakes, Daphnia lumholtzi had a high invasion success in the absence of predators. This was particularly true for the inducibly defended Texas clone. In most successful invasions, Daphnia lumholtzi reached high densities over the course of the experiment and substantially reduced the population size of native Daphnia. Surprisingly and in contrast to the results of Engel and Tollrian (2009), both clones of Daphnia lumholtzi performed better in our experiments without rather than with predation. Thus it seems that in our predation treatment, Daphnia lumholtzi either could not derive a competitive advantage from being defended, or this advantage was not large enough to compensate for the costs of defense or other indirect negative effects associated with the presence of fish, such as a deterioration of the chemical conditions in the containers. Additional observations that we made indicated that the defense of Daphnia lumholtzi was effective against some of the fish in our experiments (see also Methods section above). However, the effect of the defense could have been counteracted by the fact that fish are visual, size-selective predators and therefore might have preferred Daphnia lumholtzi over native Daphnia: Daphnia lumholtzi are better visible than native Daphnia, due to their larger body size, their conspicuously colored broods, and their stronger tendency to produce ephippia. Selective predation for individuals with pigmented reproductive structures has been shown for other Daphnia species: Mellors (1975) demonstrated that ephippia-carrying Daphnia galeata mendotae are preyed upon selectively by pumpkinseed sunfish and yellow perch. Tucker and Woolpy (1984) found that Daphnia magna with pigmented parthenogenetic eggs could be detected by bluegill sunfish from a larger distance than Daphnia without parthenogenetic broods. Large differences in visibility are unlikely for our second invasion experiment, however, where we used dark containers in order to equalize the visibility of Daphnia lumholtzi and native Daphnia. For the inducibly defended Texas clone, the weak performance in the predation treatment compared to the predator-free treatment could be partly due to the costs of developing the defenses. Following the classification of defense costs by Tollrian and Harvell (1999), these costs may include allocation costs for the formation of head and tail spines, opportunity costs such as developmental constraints resulting from the defenses and environmental costs such as a higher risk of individuals to get entangled in algal filaments. Thus one possible scenario for the Texas clone is that individuals in the predation treatment developed defenses which gave them some protection from fish, but that the costs of the defenses reduced the population growth rate compared to the predator-free treatment. High costs of their large defense structures could also explain why the permanently defended Arizona clone was less successful than the inducibly defended Texas clone under all experimental conditions. These costs might be outweighed by the benefits only at a predation pressure higher than the one encountered in our experiment, an explanation that has also been suggested by Engel and Tollrian (2009) who used the same permanently defended clone in their experiment. The Arizona clone could also have a higher sensitivity to some environmental conditions, such as crowding or water quality. Finally, it is possible that during the many generations the Arizona clone has been kept in the laboratory, it accumulated mutations that decrease its competitive ability. Overall, we conclude that the invasion of European lakes would be more likely with a clone similar to the inducibly defended Texas clone. Temperature plays an important role for biological processes, from individual physiology to ecosystems. Therefore, climatic warming has the potential to affect biological invasions at all stages of the invasion process (Hellmann et al. 2008, Walther et al. 2009, Engel et al. 2011). An example where climatic warming has led to the establishment of new populations in areas that were previously not suitable is the establishment of the palm Trachycarpus fortunei just south of the Alps (Walther et al. 2007). A similar spread into more northern regions in Italy is predicted for the tiger mosquito Aedes albopictus (Roiz et al. 2011). These predictions of regions that might become suitable for establishment in the future are based on a model that combines current distribution and temperature data with climate change predictions. In our study, the inducibly defended clone of Daphnia lumholtzi could establish at all temperatures we investigated. Since a vast number of European lakes have epilimnion temperatures above 15 °C for a considerable time period every year, e.g. 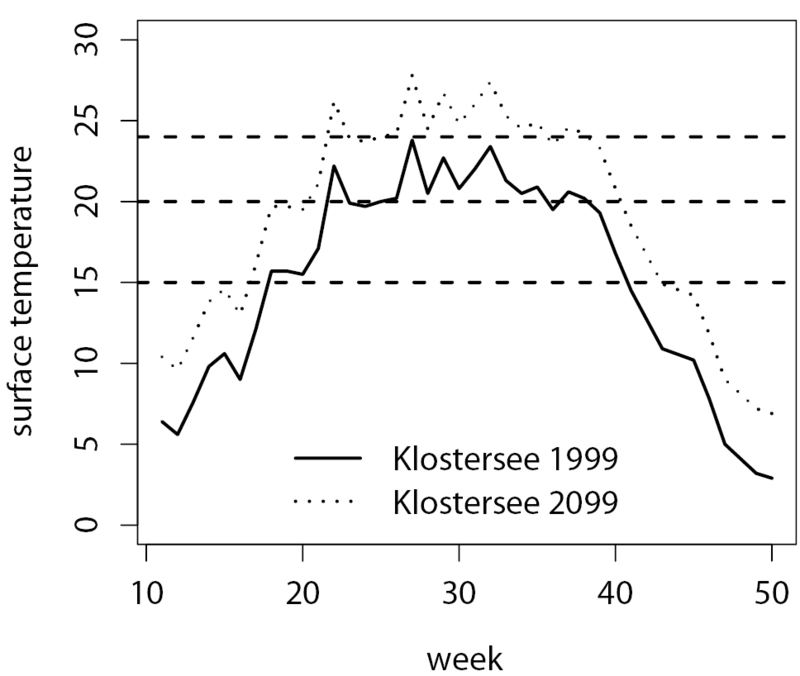 23 weeks in Klostersee in 1999 (see Fig. 1), we would expect the establishment of Daphnia lumholtzi in Europe to be possible even before further warming. We must consider, however, that the establishment of a self-sustaining population of Daphnia lumholtzi in a European lake would also require populations to survive from year to year. Since Daphnia lumholtzi populations can persist in the form of resting eggs, it is not necessary for adults to be able to survive winter temperatures. Because resting eggs are produced sexually, and the encounter rate between mating partners can be reduced in small populations, Daphnia lumholtzi might be subject to an Allee effect (Stephens et al. 1999). In this case, the growing season would have to be sufficiently long and temperatures sufficiently warm to reach high population densities and to produce enough resting eggs that will hatch in the next year. Increases in temperature may thus promote Daphnia lumholtzi establishment by helping them to overcome Allee effects, as has been suggested for another cyclical parthenogenetic cladoceran, Bythotrephes longimanus (Wittmann et al. 2011). At later invasion stages, changes in temperature may influence the growth and spread of established populations, for example by influencing their competitive abilities compared to native species (Walther et al. 2009). 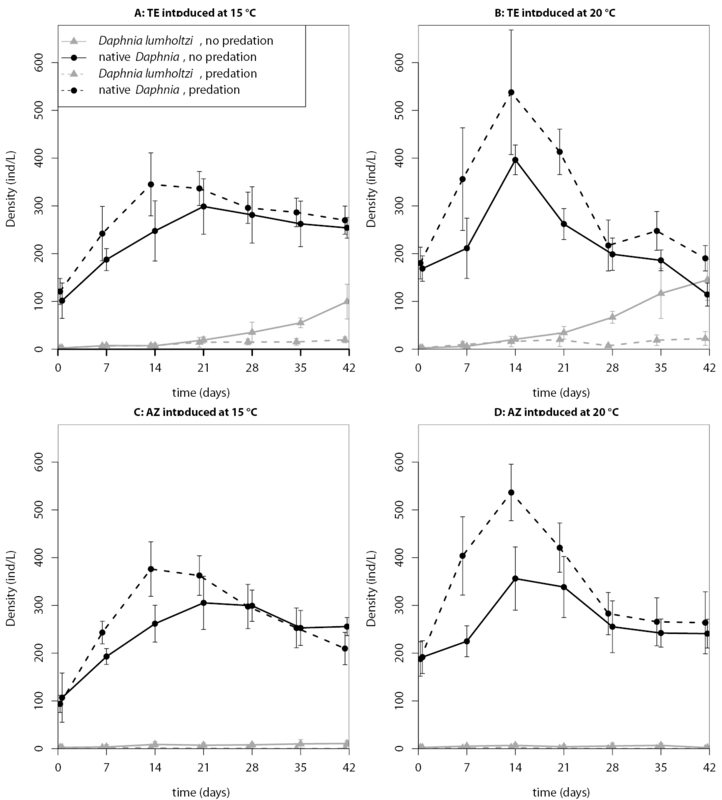 Consistent with previous studies by Fey and Cottingham (2011) and Engel and Tollrian (2012), we observed shifts in competitive dominance from native Daphnia to Daphnia lumholtzi, especially when comparing the dynamics at 15 °C and 20 °C in the long-term experiments. Such shifts in dominance from native to non-native species are predicted for many aquatic as well as terrestrial systems. Mehnert et al. (2010) compared the growth rates of native European and introduced tropical species of cyanobacteria at different temperatures and then used a model to predict a shift in dominance from native to exotic species in a future temperature scenario. In Sandel and Dangremond’s (2012) study on California grass communities, native and non-native species differed in ecologically important traits, with non-native species exhibiting more traits that are favored in regions with high temperature. Stachowicz et al. (2002) monitored the onset and magnitude of recruitment for native and introduced marine invertebrates over a time period of three years, with marked fluctuations in mean winter temperatures. They showed that the introduced species, in contrast to the native species, benefited from warmer winters. Similarly, our long-term experiments predict that Daphnia lumholtzi would benefit more from climatic warming than native Daphnia. Surprisingly, however, Daphnia lumholtzi proved to be a strong competitor in our experiments even at temperatures as low as 15 °C. Since we supplied only one algal species as resource, the potential species coexistence suggested by our modeling results is surprising at first sight. One possible explanation is intraspecific interference (Vance 1984), where Daphnia individuals are more sensitive to crowding by conspecifics than by individuals of the other species. Coexistence between the species could also be explained by temporal resource fluctuations (Levins 1979), which in our experiment could result from the two-day feeding interval and would allow for coexistence if one species is more efficient at exploiting high algae concentrations and the other specialized on low algae concentrations. A third possible explanation is that even our small experimental containers might provide different niches. For example, one Daphnia species might be specialized on algae from the bottom and the sides of the containers, whereas the other species specializes on floating algae in the medium. Although it is unclear whether these mechanisms also operate under field conditions, we would expect more niche differentiation in the field, where the algal community consists of multiple species and is also subject to seasonal changes. Thus we hypothesize that coexistence would be possible under a wider range of conditions in the field than in our experiments. This is an example for the more general problem that our native Daphnia, fish, and algae represent only a small subset of the actual native community in a natural lake. In other areas of ecological research, a field study would be a good way to test hypotheses in a more realistic setting. However, in a study on potential future invasions, this is obviously too hazardous. A safer but challenging avenue of future research is to use more complex food webs in laboratory experiments. The differential success of the two Daphnia lumholtzi clones in our study highlights that it can even be important to include a set of genotypes within the same species. Such differences in invasion success between genotypes within one introduced species have also been reported by Vellend et al. (2010) in invasion experiments with dandelions (Taraxacum officinale). They also tested different genotypes of a resident species, Poa pratensis, and found significant differences in their resistance to invasion by the dandelions. Thus, since our experimental results are based on a small subset of the naturally occurring species and genotypes, we must be cautious in transferring conclusions to the field. Nevertheless, we believe that some general conclusions for more complex natural systems are possible. Assuming that the detrimental effects of the presence of fish detected in our study do not, or less strongly, act in the field, our experiments did not identify any obstacles to an invasion of Daphnia lumholtzi in European lakes. A successful clone could be similar to the inducibly defended Texas clone, which can grow and compete for food at temperatures at least as low as 15 °C. Using our results and prior knowledge on the interaction of Daphnia lumholtzi with North American communities, what can we conclude about the potential impacts of Daphnia lumholtzi in the case of an invasion into European lakes? In contrast to some studies that found only weak effects of competition and suggest that Daphnia lumholtzi might be filling an empty niche in North America (Johnson and Havel 2001, Havel and Graham 2006), our results indicate that competition between Daphnia lumholtzi and native European Daphnia may be strong, and that Daphnia lumholtzi may suppress the population growth of native Daphnia and even outcompete them in some cases. In accordance with Dobberfuhl and Elser (2002), the carrying capacities estimated under the Lotka-Volterra model indicate that total Daphnia abundance and possibly also biomass may decrease with increasing Daphnia lumholtzi abundance. This can have impacts on the population dynamics at higher trophic levels, such as on planktivorous fish. We would like to thank Mechthild Kredler for support in the laboratory, Achim Weigert for help with native Daphnia sampling, Sabine Gießler for identification of native Daphnia, Dirk Metzler for statistical advice, Katharina Engel for helpful discussions on Daphnia lumholtzi, as well as Jennifer Lohr, Wolfgang Rabitsch, and an anonymous reviewer for comments on the manuscript. JMJ acknowledges financial support from the Deutsche Forschungsgemeinschaft (DFG; JE 288/4-1). Benzie JAH (2005) Cladocera: The genus Daphnia (including Daphniopsis): (Anomopoda, Daphniidae), Volume 21 of Guides to the identification of the microinvertebrates of the continental waters of the world, KenobiProductions(Ghent): 208–213. Engel K, Tollrian R (2012) Competitive ability, thermal tolerance and invasion success in exotic Daphnia lumholtzi. Journal of Plankton Research 34: 92-97. doi: 10.1093/plankt/fbr083. John DM, Tsarenko PM (2002) Chlorophyta: Chlorococcales. In: John DM, Whitton BA, Brook AJ (Eds). The Freshwater Algal Flora of the British Isles. Cambridge University Press (Cambridge): 327-409. Tollrian R, Harvell CD (1999) The evolution of inducible defenses: Current ideas. In: Tollrian R, Harvell CD (Eds). PrincetonUniversity Press (Princeton, NJ): 306-321.